This page is dedicated to News articles published in the public domain about fossils. Click on the links below for additional information about each article..
Sea Monsters Unearthed: Life in Angola’s Ancient Seas will be in Washington D.C.opening November 9 in the most visited educational space in the world, the Smithsonian Institution United States National Museum of Natural History. For more information, please follow this link. A second shipment for the exhibit sent iwas sent in October from SMU. On March 22, 1991, David Kring stood at a podium at the Lunar and Planetary Science Conference in Houston and revealed the exact location of the most important impact event in the past 100 million years. 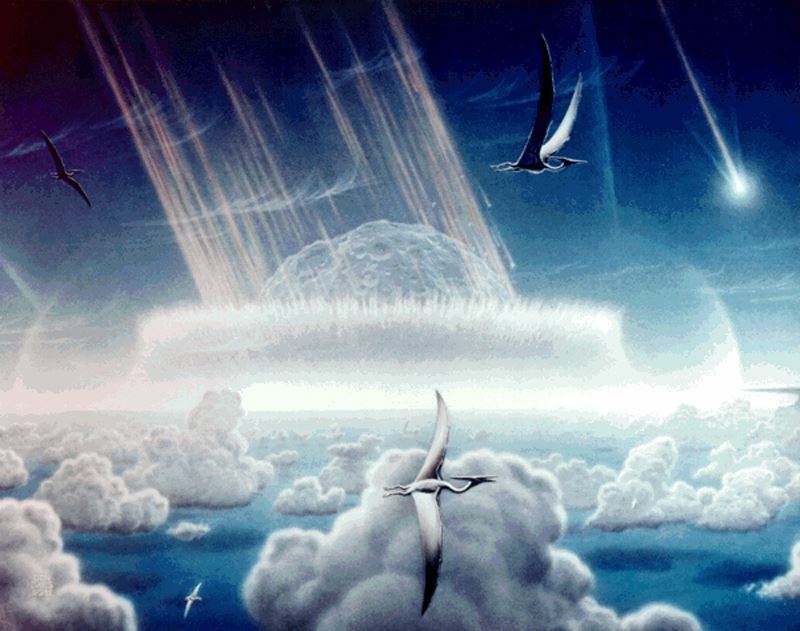 The dinosaur-killing space-rock struck Mexico’s present-day Yucatan Peninsula near the town of Chicxulub. By that time, most geologists already accepted Luis and Walter Alvarez’s once-wild theory that a 65-million-year-old, worldwide layer of iridium — a material common in asteroids, but not on Earth — implied an extinction event. But for a decade, scientists had tried and failed to find the crater. That led many to assume an impact in the deep ocean, which might explain the absence of a bowl as big as Connecticut. Kring didn’t buy it. His gut told him the Mount Everest-sized space rock struck closer to land. The path to proving it started along the banks of the Brazos River in Texas. In 1985, Jan Smit, a paleontologist at University Amsterdam, and A.J.T. Romein of the State University of Utrecht, published a summary of what was known about the Cretaceous-Tertiary event — the moment when most of Earth’s life died. Their lengthy report looked at evidence from around the world. But it was just one sentence in that 16-page paper that stood out to Kring. The paleontologists pointed to a thick layer of sandy sediment “This may be the first evidence of impact (tsunami)–triggered sediment,” Romein and Smit wrote. That set Kring searching for an impact crater in the western hemisphere. Scientists found the next clue in the Caribbean. Florida International University scientist Florentin Maurrasse spotted an unusually thick layer of iridium near Beloc, Haiti, that implied the dino-killing impact couldn’t be far off. And when American television producer Robin Bates flew out for a science show about the site, he returned with a sample for Glen Izett, a geologist with the United States Geological Survey, who was next on his interview list. Inside the sediment, Izett found tiny bits of glass. These so-called tektites are only found close to impact sites. “That told us that somewhere in the Caribbean there was a crater,” says Kring. And it turned out that two geophysicists, Glen Penfield and Antonio Camargo, had already stumbled across ground zero on Mexico’s Yucatan Peninsula while looking for oil deposits. The pair wondered if the strange site was an impact crater or some kind of volcanic feature. Fortunately for Kring, the petrol hunters did exactly that. And when the pair shared the drill cores brought up from a site called Yucatan-6, it showed shocked quartz — the rocks were melted with the telltale signs of an extraterrestrial impact. Kring got to present the smoking gun at LPSC back in 1991, but he says the find was really the work of seven North American geologists. And after he finished his talk, one man stood up in the audience. It was esteemed astrogeologist Eugene Shoemaker, the leading expert on asteroid impacts and a scientist who prepped astronauts to travel to the moon. “You got it,” Shoemaker said. The other impact crater experts in the room that day bought the evidence as well. Later that night, a group gathered to plan the first scientific drilling operation at Chicxulub. But to convince the larger geology community, Kring needed to tie the rocks recovered from Chicxulub to the rocks found in Haiti and conclusively date the impact crater. So, instead of heading to the impact site, he stayed in the lab. Over the next year, Kring was able to chemically link the sites. That scientific paper set off headlines around the world in 1992 and launched the word “Chicxulub” into the public vernacular. Chicxulub also allowed Kring and his colleagues to create a laundry list of specific environmental impacts. But scientists still don’t fully understand how global ecosystems collapsed, or exactly how they eventually recovered. In the coming weeks, a team of scientists will begin drilling Chicxulub’s central peak ring for the first time. Discover will be on site in Mexico as the team tries to answer some of those questions. A group of researchers working in South China recently unearthed the fossil remains of 520-million-year-old, centipede-like creatures whose central nervous systems had been preserved in remarkable detail, down to individual nerves. Chengjiangocaris kunmingensis was a small creature, just 2 to 4 inches long, with a segmented, armor-plated body and a heart-shaped head shield. As part of a now-extinct group called fuxianhuidae, it walked the Earth on its 80 pairs of legs during the Cambrian period, a time around 500 million years ago when primitive organisms began to evolve in many directions, causing an explosion of biodiversity. Most of the animal phyla we know today first started to show up in the fossil record during the Cambrian, and that’s what makes C. kunmingensis so important. A team of paleontologists led by Jie Yang says that studying its well preserved central nervous system could help them better understand how the nervous systems of today’s crustaceans and creepy-crawlies evolved. They published their findings in the Proceedings of the National Academy of Sciences. The Arlington Archosaur Site is in the news! More than a decade after the first fossil was unearthed, the Arlington Archosaur site continues to yield new, ancient discoveries. On a recent Saturday, volunteers uncovered a fossilized bone from a prehistoric crocodile. "We have four, maybe more, species of crocs here and this represents probably one of the younger individuals of one of our big crocs," said Dr. Chris Noto, paleontologist at the University of Wisconsin who oversees the dig site. "We're talking about 95 to 96 million years ago," Noto said. "And at this point, the Dallas-Fort Worth area was prime ocean-front real estate". The thousands of fossils collected from the Arlington Archosaur site are now at Fair Park in Dallas, kept securely cataloged at the Perot Museum of Nature and Science Building. "It's the diversity of what's coming out of here. I mean, we have crocs, turtles, dinosaurs, fish fragments," said Dr. Ron Tykoski, Perot Museum Fossil Preparator. "Just an incredible number of species of things out there splashing around, eating one another and trying not to be eaten at the same time. So many things come out of here and it's going to allow us to paint a really full picture of what life was like right here in Dallas-Fort Worth 95, 96 million years ago." Volunteers still gather weekly to excavate the hillside, each highly skilled at carefully searching for evidence of an ancient age. "My heart beats when I find something new," said Stephen King, who started volunteering eight years ago. "I'm just uncovering the past. The crazy thing about it, the bones talk to me. They don't tell me what I'm going to find during the day, but they just show me the land in my dreams where I'm going to find something." "Every new fossil that we find here, every new piece of information that we uncover is important," said Noto. "Because there's nothing else quite like this outside the DFW area." A new species of pterosaur has been named based on a fossil from northern Texas.Cimoliopterus dunni was named after Brent Dunn, who discovered the fossil. An artist's rendering of the pterosaur Aetodactulus halli (named after Lance Hall of the DPS). Andrew Buckley Special to the Star-Telegram The first Fossil Fest of Grapevine held this past week was a huge success. Check out the video from the Star Telegram of the activities and some of our own members here. Even before the age of dinosaurs, enormous, toothy predators were roaming what is now Texas. New work led by the Museum shows that giant sharks were hunting in the shallow waters that once covered most of North America for much longer than previously thought. 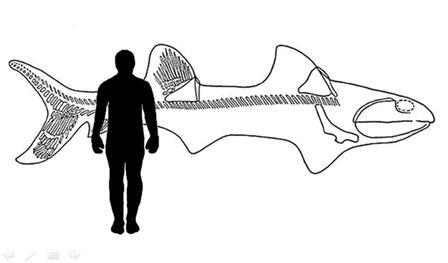 A reconstruction of the Texas “supershark” in comparison to a human. Researchers from the Dallas Paleontological Society recently discovered a pair of fossil braincases from massive, and now extinct, relatives of modern-day sharks in rocks from Jacksboro, Texas, that date back 300 million years. The researchers, Mark McKinzie and Robert Williams, donated the fossils to the Museum and worked with John Maisey, a curator in the Division of Paleontology, to estimate how big the sharks would have been by comparing them to smaller, more complete fossils of closely related sharks. The results suggest that these two Texas ‘supersharks’ measured between 18 and 26 feet in length (5.5 to 8 meters). The largest of these specimens would have been 25 percent bigger than today’s largest predatory shark, the great white. 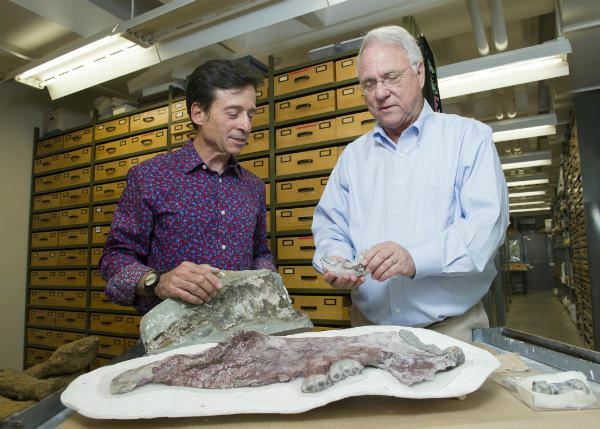 “Everything is bigger in Texas, even 300 million years ago,” Maisey said. These new fossils indicate that giant sharks go much further back into the fossil record than previously thought. Prior to this find, the oldest giant shark specimens had been recovered from rock dating back just 130 million years. The largest shark that ever lived, C. megalodon is much younger, with an oldest occurrence at about 15 million years ago. The fossil braincases may belong to an extinct species of shark called Glikmanius occidentalis, or they may represent a larger related species that is new to science. The researchers presented their findings on the new Texas “supershark” at the annual meeting for the Society of Vertebrate Paleontology in Dallas on October 16. Everything I knew about paleontology conferences, I learned from TV and “Friends.” There was that time Ross and his girlfriend were prepping for a conference in Barbados. "By using CT scans and computer imaging, we can in a very real way bring the Mesozoic era into the 21st century,” Ross says. Louis Jacobs, a vertebrate paleontologist at Southern Methodist University, and Anthony Fiorillo, a paleontologist at Dallas’ Perot Museum, are helping organize the conference. Walking with them is like trailing a rock star -- they’re inundated with fans and well-wishers. ”We specialize in animals with backbones, and how they’re preserved in the rocks, and what they mean, and what they tell us about the earth got to be the way it is,” Jacobs explains. For example, Jacobs says, we wouldn’t know much about past climates if it weren’t for rock records -- and fossils. This kind of knowledge helps scientists predict what might happen in the future. And the pair recently announced they had a ground-breaking find: a new species of marine mammal. “I’d heard rumor that there were some scrappy fossil mammal remains that had been found out there, so I asked Louis to come with me, and we went to the city of Unalaska,” Fiorillo says. On that Aleutian island, southwest of the mainland, they were presented with a big block of unidentified fossil remains. And in that block, they discovered something new -- something they’d never seen before. Hippo-sized, it lived 33 million years ago. It had a huge snout and tusks, and swam like a polar bear, with its front legs paddling. It was vegetarian, and consumed food by sucking it like a vacuum. The conference continues until Saturday, and is at the Hyatt Regency in Dallas. 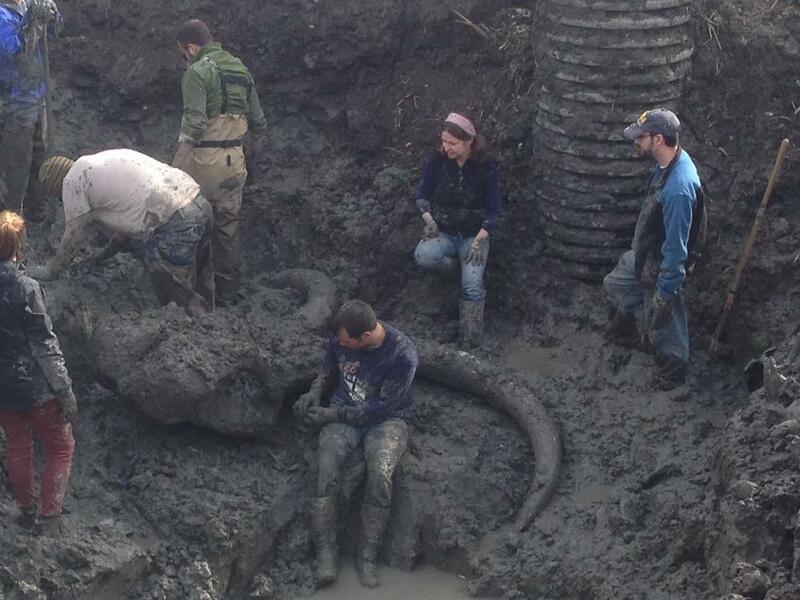 Farmer James Bristle came across a surprising find while digging in a soy field with a friend near Chelsea, Michigan -- the remains of a woolly mammoth. "It was probably a rib bone that came up," Bristle told the Ann Arbor News. "We thought it was a bent fence post. It was covered in mud." Read about a new species of dinosaur, that lived in the cold and the dark of Alaska. Click Here. Homo naledi, discovered in a cave near Johannesburg, is a human ancestor unlike any species previously known. The find is arguably one of the most important discoveries in human origins research in half a century. It’s also the most perplexing. Acting on a tip from spelunkers two years ago, scientists in South Africa discovered what the cavers had only dimly glimpsed through a crack in a limestone wall deep in the Rising Star Cave: lots and lots of bones. The remains covered the earthen floor beyond the narrow opening. This was, the scientists concluded, a large, dark chamber for the dead of a previously unidentified species of the early human lineage - Homo naledi. Allonautilus, possibly the World's Rarest animal, spotted off the coast of Papua New Guinea. To read about this amazing creature, click here. Several fossilized dinosaur tracks buried for millions of years have been discovered along the shore of Lake Grapevine, unearthed by the heavy rainfall and high lake levels this past spring. "The area around the lake has been completely transformed by the high water levels," said paleontologist Christopher Noto, with the University of Wisconsin, who made rubber molds of the tracks.